As we begin talking about mustard, I will warn you that it is one of the f avorite flavors in my household. I use it in various forms, with the seeds, in fresh pastes and also use mustard oil. I use mustard greens too, but unlike fenugreek, I do not consider the greens a spice, but rather place them in the greens category, mostly because of the heavy leafy appearance. Nonetheless, mustard greens certainly have enough zest in them to carry out the family name. Whole mustard seeds, are used as a base seasoning in a lot of Indian dishes, I personally love to pair them with a touch of ginger. When added to hot oil, the mustard begins to pop, much like popcorn. Well, not quiet, the sound is similar, but they do not puff up. However, something magical happens to these seeds, they develop a mellow and nutty flavor. 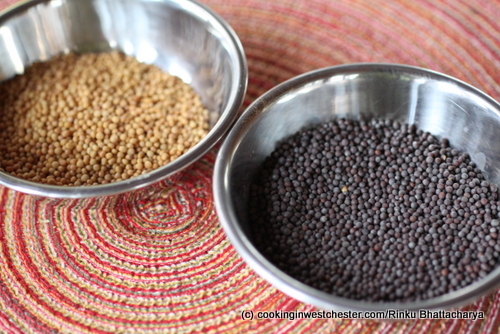 Mustard seeds are found in black and yellow varieties and the yellow mustard seeds are the milder of the two varieties. In this recipe, I have paired them with summer zucchini, which gets tossed with tomatoes, coconut milk and curry leaves. I shall tell you all about curry leaves one of these days, but for this recipe you have to take my word that it works. This recipe is a simple and very flavorful creation that is a rich tasting vegan creation. A lot of my students tend to ask me to stratify recipes to match their diet preferences so, I tend to tag recipes that vegan, diary and gluten-free and this one happens to be all of the above, but it works for me because it is tasty. This year, we had a pleasant surprise in the garden by way of zucchini, we found that the garden was filled with the soft light green variety. It happened to be an accidental seed mix up, but I like the delicate flavors of this lighter variety more than the darker green ones. Although, lets face it, it is hard to go wrong with something that pairs fresh summer tomatoes and zucchinis, I think. I may not relish the hot temperatures we have been having, they have been doing wonders for the tomato plants that we have. On a color note, August 15th, is the 65th anniversary of the Indian independence. These colors was as close as I could get without going nutty, to the traditional saffron, white and green which are the colors of the Indian flag and are the colors to celebrate the day. 1. Heat the oil on medium heat for about 1 minute, add in the mustard seeds and wait for them to crackle, this should take less then 10 seconds if the oil is hot. 2. Add in the curry leaves and the red chilies and stir once. 3. Add in the red onion and the ginger and saute for about 5 to 6 minutes, until the onion softens and begins to turn golden. 4. Add in the tomatoes and cook until the tomato softens, this takes about 3 to 4 minutes. 5. Add in the zucchini and the salt and the coconut milk. Simmer for 10 minutes, until the sauce thickens and the zucchini is nice and tender. 6. Squeeze in the lime juice and garnish with the chopped cilantro and serve over steamed brown rice. 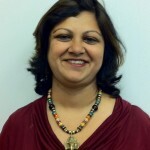 Rinku Bhattacharya is a daytime financial professional, who spends the rest of her time immersed in food. 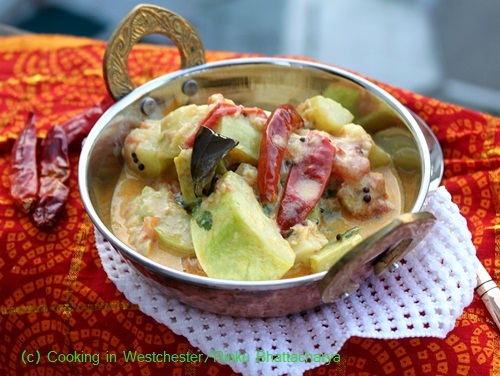 Rinku is the author of the blog, Cooking in Westchester, where she shares her life experiences, original recipes that combine Indian flavors with produce from her backyard and local farmers markets. Rinku is blessed with a gardener husband, who always surprises her with a prolific and fresh supply of produce to keep her creative instincts flowing. 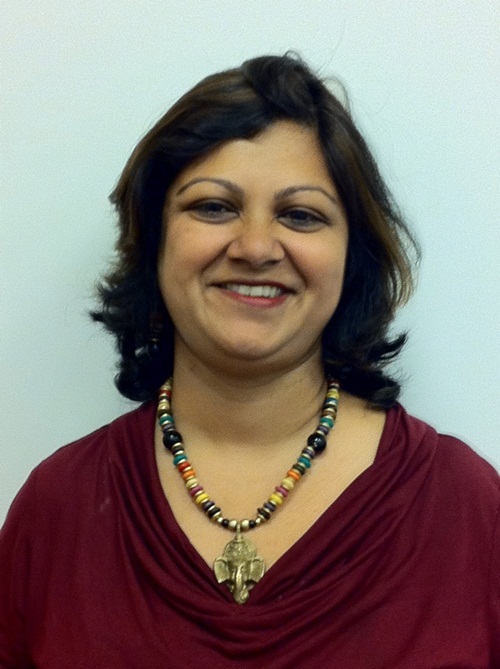 Rinku has been teaching recreational cooking classes for the past six years, and has found her classes a great way to teach and learn.